The region's online source for news, sports and lifestyle information. 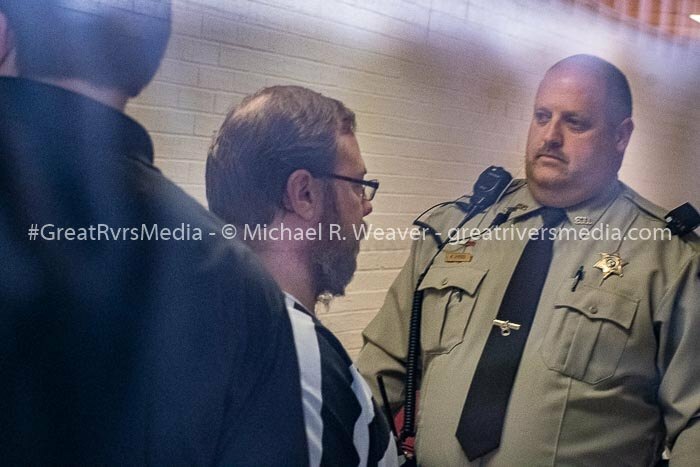 JERSEYVILLE - Michael Roberts is taken to sentencing for the 1st degree murder of his six year old son Liam Roberts before Circuit Judge Eric Pistorius on Wednesday, January 16, 2019. He received a 25 year sentence with 3 years of supervised release. JERSEYVILLE- Wednesday morning was a period filled with emotion in the Jersey County Courthouse. Mike and Georgena Roberts were sentenced for a guilty plea to the first-degree murder of 6-year-old Liam Roberts, their son. The Roberts' were escorted into the courtroom by deputies and were seated at the defendant's table with their attorneys present. The defendants were clad in black-and-white horizontal stripe jail clothing and were wearing bright orange slippers. On the prosecution table was a four to five inch thick inch stack of documents relating to the case and a book of statutes. Before the hearing began, Jerseyville Police Chief Brad Blackorby and Officer Scott Woelfel were standing at the rail talking to various people in the room as numerous other law enforcement personnel scanned the crowd. The court gallery filled to about half capacity for the hearing. Jerseyville Police Chief Blackborby walked to the center of the courtroom and embraced the new Sheriff, Mike Ringhausen. State's Attorney Ben Goetten then announced that the state was ready and after a slight delay, Circuit Clerk Charles Huebener told everyone to rise as Circuit Judge Eric Pistorius took the bench. Judge Pistorius looked around and remarked from the bench that it was a large crowd for this type of weather. Judge Pistorius then started the proceedings, going over the offense and the penalty and said it would be a 100-percent time served sentence due to the nature of the crime. The judge said there were some questions regarding Georgena in the pre-sentencing about her mental health, but she was evaluated by a doctor and found to be fit for trial and ultimately, she entered the guilty plea. Statements were offered by several people for the prosecution. Included were Michael Roberts son, ex-wife and Officer Woelfel. The son said that he feels his father ruined his life. He want on to say that his father "...never has been a person who displays sympathy and deserves none". The biological mother, Kim Roberts, said Mike Roberts failed to protect the children. She said she now has recurring nightmares about her now dead son. She added, "Liam was an easy child to love". As Kim Roberts was nearing the end of her remarks, she started to cry and State's Attorney Goetten attempted to comfort her, putting his arm on her shoulder and offering her a tissue. Officer Scott Woelfel then took the stand and talked about how he got the call in 2017 from Jersey Community Hospital and was informed when he arrived about suspected child abuse. He said that when he saw the six year old child laying on a hospital bed that he was wearing Halloween pajamas. Examining the child he said the the boy's ribs were clearly visible and he was covered in sores. He went on to say that the child weighed 17 pounds and wore 2-year-old-sized clothes when he saw him. Woelfel said that subsequent investigation revealed that Michael Roberts had received a phone call at work earlier in the day and was overheard by coworkers saying, "Is he breathing?". According to the testimony, no 911 call was made. According to Woelfel, Georgena left Liam alone on the couch when she left home to pick up other children from school and it was only after Michael Roberts was home from work that Liam was taken to the hospital. Woelfel also said that Liam's last meal was bologna with other children being fed chicken and french fries the evening before his death. He went on to say that the boy's last normal meal was approximately one year before his death. A search of the home discovered that the doors to the basement, where Liam was forced to stay, had locks installed that required someone upstairs to let him out of the basement. Michael Roberts' attorney talked about the horrible cost of incarceration and that it would cost at least $750,000 to keep Michael in prison for 20 years based on the information she had regarding the cost of incarceration. Michael Roberts then made a statement saying not a day goes by that "I don't regret my failures as a man. Liam was my special little buddy and constantly by my side. I failed at the most basic level and Liam and my kids paid the unimaginable price. I didn't remove Liam and my kids from a toxic situation. How did I let my child suffer? I put myself above my kids." 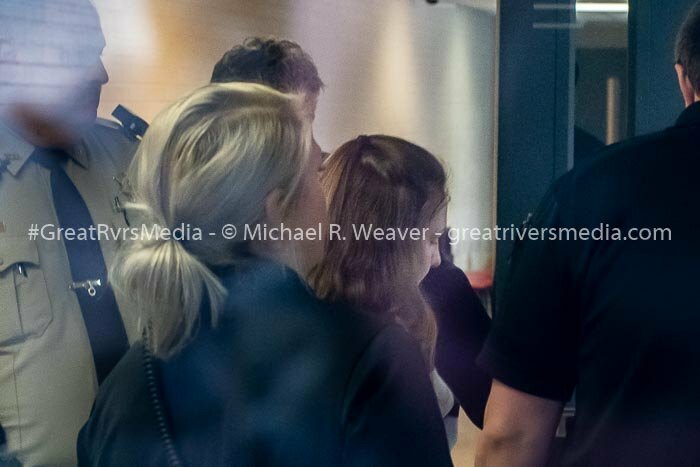 JERSEYVILLE -Georgena Roberts is taken to sentencing for the 1st degree murder of her six year old stepson Liam Roberts before Circuit Judge Eric Pistorius on Wednesday, January 16, 2019. She received a 20 year sentence with 3 years of supervised release. Georgena followed, making a statement while crying, saying "we were a family in a major crisis and spiraled out of control. Five other children are going to have grow up without the only parents they have ever known... Two extended families are completely shattered". Judge Pistorius then left the courtroom for a time and at some point a deputy announced to the gallery during the recess that they needed to quiet down. For most of the time during testimony, Georgena Roberts was rapidly moving her slippered feet up and down as if she were rapidly tap dancing while sitting. This ended as soon as Judge Pistorius returned. The judge said, "I've been doing this for 14 years and there a lot of good days... but this, unfortunately, is not one of those days". He proceeded to say the court acknowledges the pleading guilty to first-degree murder takes the hardest part away from the state. The judge stressed that the two didn't have any prior history of anything major before this crime. The judge issued the sentence for 20 years and three years supervision to Georgena and 25 years and three years supervision to Michael Roberts. The judge asked both Michael and Georgena Roberts if they both understood and both acknowledged that they did. The judge went over setting the judgement aside and appeals and then closed the hearing. Both Roberts' were led away with Georgena embracing someone in the gallery before she left the courtroom. Jersey County State’s Attorney Ben Goetten and Jerseyville Police Chief Blackorby issued a statement that read, “We are all glad to see the conclusion of this case. It has been a tireless, disheartening process for the family as well as those involved in the investigation and prosecution. The two solely responsible for the death of this beautiful child and will now spend the better part of their adult lives in prison, where they belong.